Once upon a time, there was a young couple named Robby and Wendy. We were part of a larger circle of friends at college, went to classes and concerts together, and often hung out at a local greasy spoon enjoying French fries, “Highway 59 Burgers”, and coffee descended from a questionable bean-ealogy. As our friendship grew into a ‘relationship’, we went on our first fancy date where we wore fancy clothes and drank the fanciest wine we could afford without bankrupting our meager college funds. Another time, in the aforementioned greasy spoon, we sketched multiple designs on paper napkins as we imagined how we could convert a railway caboose into a livable space. (Maybe my bass amp could double as an endtable?) The location wasn’t fancy, nor was Mateus involved, but it was fun to dream together about our future. As the years have come and gone, we’ve evolved a few traditions as a couple. For example: as the first one up most mornings, I brew and hand-deliver a cuppa java to my beautiful wife in bed. Note to any husbands reading: there are few wives who won’t appreciate this. A more recent invention is what we call “happy hour library”: we sit on our deck in the evening, sipping wine as we read whatever books have caught our fancy. Occasionally, we read a snippet out loud to each other, whenever we discover a thought-provoking question, an inspiring idea, or a particularly well-crafted paragraph. A few weeks ago, Wendy brought home a bottle of Mateus, and we sat on the deck with our books and reminisced about that first “fancy” date. We’ve never lived in a converted caboose, but we’ve had a lot of adventures together. None of which we could have predicted — or dreamed — back in the days of the ‘caboose brainstorming’. But now, it’s the ‘little adventures’ that I appreciate the most: the coffee shared at 6:00 in the morning, and Happy Hour Library. 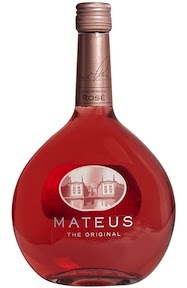 And Mateus — while not our nostalgic ‘go-to’ wine of choice — held up surprisingly well, all these years later.